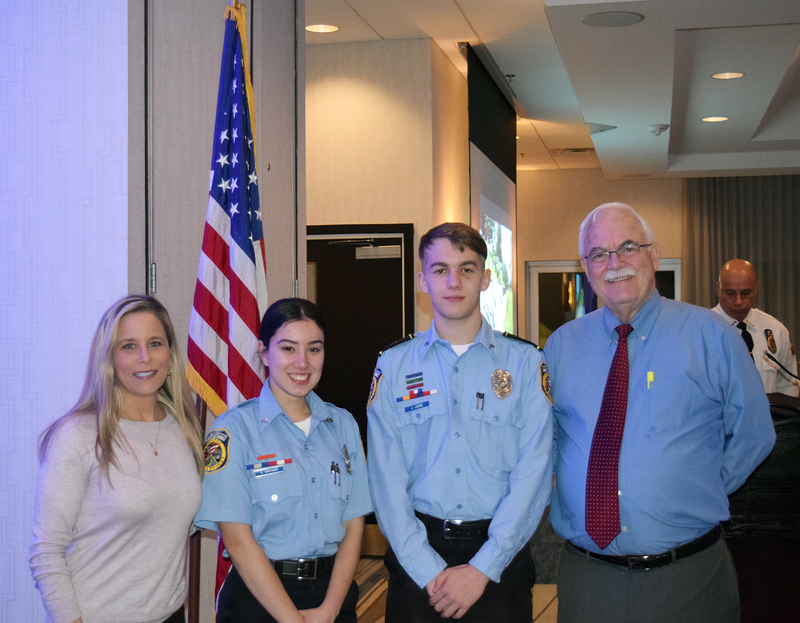 Photo (L-R): State Representative Cara Pavalock-D’Amato stands alongside Explorer of the Year winners Krystal Santiago, Jake Leone, and Representative Whit Betts during the Bristol Police Explorer Post 111 Awards night dinner held at the Double Tree Hotel in Bristol. BRISTOL – State Representatives Cara Pavalock-D’Amato (R-77) and Whit Betts (R-78) celebrated the accomplishments of several young men and women Wednesday night during an annual awards event held for those enrolled in the Bristol Police Explorer Post 111 program. The program consists of youths between the ages of 14 and 21, who either live in Bristol or a bordering town that doesn’t currently have an explorer program available and are interested in the criminal justice field. In order to be accepted, they must submit a formal application and pass a background investigation. The Police Explorers learn the duties of Law Enforcement Officers from career fields such as Police Patrol, Federal Bureau of Investigation, Department of Environmental Protection, Forensics, Emergency Dispatching, Military Police, as well as other aspects of law enforcement. “The Bristol Police Explorers program is an incredible opportunity for local teens interested in law enforcement to get real hands on knowledge in the field and experience some of the rigorous demands the members of our police departments must endure as part of their training,” Rep. Pavalock-D’Amato said. “Last night, I was invited to the Bristol Explorers Awards Dinner and listened alongside their proud families to the amazing achievements of a select group of young men and women who are learning from the Bristol Police Department how to become successful leaders. To observe the close relationship and respect between the Bristol Police Officers and our local youth was so heartwarming and inspiring. I am so impressed and excited about the Bristol Explorers program, and they are a wonderful example of a very successful program that develops great leaders,” Rep. Betts said. The representatives presented an official citation on behalf of the Connecticut General Assembly to Explorer Krystal Santiago and Explorer Jake Leone in recognition of being named Explorer of the Year.